PHUKET: Poor diet is hampering Phuket children’s mental development, a seminar attended by Phuket school directors and health officials was told this week. 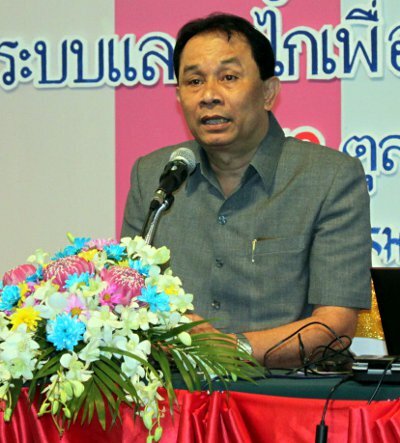 “According to research by the Department of Mental Health, poor diet is already causing problems, with many children suffering stunted growth or being under- or overweight,” said Phuket Provincial Chief Administrative Officer (Palad) Chaiwat Taephee. “And it is also inhibiting their capacity to learn and solve problems,” he added. At the seminar to hear Mr Chaiwat’s concerns were health officers, representatives from each of the 18 local administration organizations (OrBorTor) on the island and the principals from 21 Phuket schools. Mr Chaiwat said that Phuket students attaining higher than average IQ (intelligence quotient) scores in a recent government survey was to be praised, but school directors were not to rest on their laurels. “Phuket children scored above-average IQs. Phuket ranked number 14 in Thailand and number 1 province in the South. “But that is no reason to relax, because many of the children in our nurseries and schools are still suffering from malnutrition. They are short, thin and fat – and all this affects their mental development and learning skills,” he said. “The research indicates that we need to encourage people to live healthily, to eat a proper, nutritious diet at the right age. We must start from pregnancy. Pregnant women must have access to the appropriate food as well as Triferdine, which includes the iodine, iron and folic acid necessary for the complete development of the unborn baby’s brain. “Babies must be breast fed for the first six months, together with iodine, iron and folic acid supplements, and then they must have the right nutrition fed to them by their families, at nursery centers and at schools,” he said. “If we coordinate and take good care of our children by giving them nutritious food, and raise them well and offer them a good education, then Phuket children will certainly be above average,” he added.